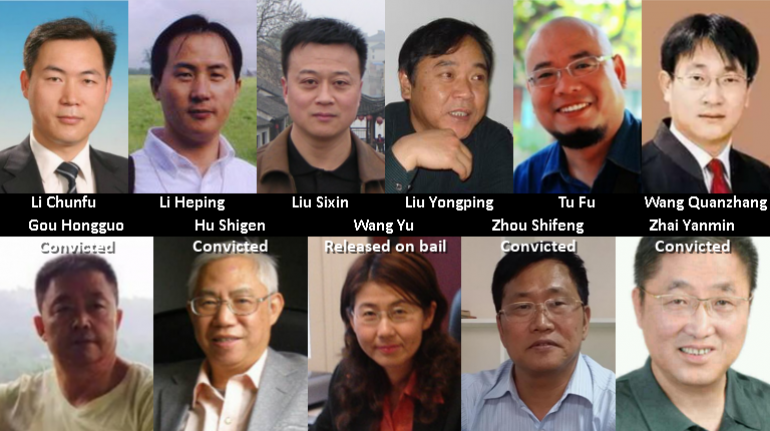 The advocacy group Human Rights in China urges the international community to follow developments in the cases of Li Chunfu (李春富), Li Heping (李和平), Liu Sixin (刘四新), Liu Yongping (刘永平), Wu Gan (吴淦) (aka Tufu屠夫), and Wang Quanzhang (王全璋), who—more than a year into their detention—are still awaiting trial on the charge of "subversion of state power." Photo Credit: HRIC (www.hrichina.org/en), all rights reserved. Chinese New Year is meant to be a time for family reunions and celebration, but for Wang Qiaoling and Li Wenzhu, Jan. 28 will be just another lonely day without their husbands. Ms. Wang's husband, Li Heping, and Ms. Li's husband, Wang Quanzhang, both Beijing-based lawyers, were taken away by police amid an unprecedented, mass crackdown on human rights lawyers in July 2015. They have been held in detention ever since and have not been allowed to see their lawyers or wives. After six months held incommunicado, they were charged with "subversion of state power." Their cases have still not been tried in court. About 300 lawyers and rights activists were interrogated, detained and harassed by police in that 2015 crackdown. Most have since been released, but four have been sentenced to jail after being held for more than a year. On Jan. 23, Ms. Wang and Ms. Li learned from a reliable source that their husbands had been tortured in different ways while in police detention, including receiving electric shocks that left them unconscious. The Hong Kong-based rights group China Human Rights Lawyers Concern Group also issued a statement quoting the same source. Rule of Law and other 'Western' notions are worrying Beijing. Here's why. The two women tell America that they are in “no doubt” that the news is genuine as it is consistent with what other people swept up in the same crackdown said of their experience after they were released. Many said they were fed dozens of pills every day, including tranquilizers and drugs for schizophrenia; locked up in a dark, curtained room; sleep deprived and subject to endless interrogations around the clock until they confessed to crimes they had not committed. Although the lawyers’ wives had suspected that the same might have happened to their husbands, the news still came as a shock. “Before, we could only imagine what he might be going through, but when this has been confirmed...my pain is indescribable,” Ms. Li says. Ms. Wang’s husband Li Heping wrote about the horror of torture in 2007. As he was leaving work one day, he was picked up by unidentified thugs, hooded and bundled into a car and taken to a secret location where he was kicked, punched and beaten with an electric baton for several hours overnight. The thugs warned him against engaging in more advocacy for human rights. “What I couldn’t stand were shocks from a high-voltage electric baton. [The pain] sent me rolling around on the floor,” he wrote later. To add to the wives’ worries, when Mr. Li’s brother, Li Chunfu, was released on bail on Jan. 12 after spending more than 500 days in detention, they found him in a psychologically disturbed state. His eyes were glazed and he could utter nothing but nonsensical words. Doctors said the released lawyer, who had been swept up in the same clampdown that captured his brother, displayed symptoms of schizophrenia. In late January, more details of torture suffered by those caught up in Beijing’s crackdown emerged as lawyers for human rights attorney Xie Yang, detained on the charge of “inciting subversion of state power,” released a transcript of an interview with him that had been conducted earlier in January. Mr. Xie told his lawyers that he had been punched, insulted and had cigarette smoke blown into his face. He had been chained to a metal interrogation chair and made to sit for more than 20 hours at a time on stacked-up stools and interrogated while he was deprived of sleep and water until he broke down. The interrogators forced him to write and sign statements to admit his work was “anti-party and anti-socialist” and to claim he was engaged in human rights defense work for fame and money. This grisly account paints a bleak picture of the treatment of the other key targets of the crackdown, including Mr. Li and Mr. Wang. Four people arrested in 2015 have been sentenced—a lawyer and an activist were jailed for seven and seven and a half years respectively; another two activists were given suspended jail sentences. Several were paraded on state and pro-Beijing Hong Kong media, “confessing” to their supposed guilt. Those who have been released remained under surveillance; their movements closely monitored by the police. “The authorities will do anything to get the desired result: having a defeated and dejected political prisoner either humiliate himself or dejectedly and publicly submit to the authorities’ will and admit that they engaged in activities that were against the Communist Party,” he says. China has laws banning torture in custody and ratified the United Nations Convention against Torture in 1988, but the use of torture in police custody and arbitrary detention is widespread. Rights groups have said unchecked police power and Chinese authorities’ obsession with “stability maintenance” and disrespect for human rights are to blame. The torture of the rights lawyers showed that “there is an urgent need to revise Chinese laws on torture in order to come into compliance with the [U.N.] convention against torture,” Mr. Nee says. The two wives note the irony that many of the human rights attorneys subjected to this ordeal, among them Li Heping and Wang Quanzhang, have long campaigned for the end of torture. “Someone who is against torture being tortured—this is the reality in China and it is so sad,” Ms. Li observes. Ms. Wang says in engaging in the fight against torture, her husband was aware that he might end up being a victim one day, a risk he was willing to take for the greater good.